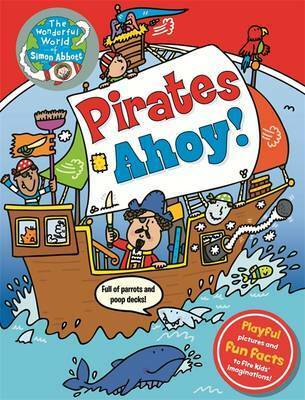 The Wonderful World of Simon Abbott – Pirates Ahoy! This fantastic introduction to life on the high seas will shiver your timbers! Simon Abbott’s quirky drawings bring to life the core subject’s from the early years of school, with laugh-out-loud pictures that kids will love to pore over and bite-sized text to help them learn as they laugh. DID YOU KNOW? Anyone who broke a pirate ship’s rules would be left behind on a desert island. Pirates were fierce robbers who sailed the seas. The most famous pirates lived around 300 years ago, stealing from other ships and lands. Let’s see where they got up to no good. Pirates’ ships looked terrific and often quite scary. They were smelly and crowded, but they were home. Pirates were an odd bunch – poor sailors and fishermen, escaped slaves, and those who were just plain greedy. Once on board they all knew what they had to do. A pirate crew had lots of tough jobs to do. Some of these were quite dangerous. Pirate captains loved to dress up in the fanciest clothes they’d taken from their victims. Everyone else dressed a bit more sensibly for life at sea. After a few weeks at sea, a pirate’s menu would be worse than a school dinner because the fresh food would have run out. Most pirates’ idea of a good time at sea was being horrible to their victims… but when they landed on a safe island they could stretch their sea-legs, have a party and go a bit wild! Pirates raided other ships for any stuff that was valuable. This could be all sorts of things. Some might surprise you! Pirates liked to avoid battles if they could. One way was to fool their victims into giving in instead of fighting them. They had lots of tricks up their pirate sleeves! Packed full of playful pictures and fun facts that have really captured Tigger’s imagination. With a RRP of just £5.99 this would make a great stocking filler or the perfect birthday gift, especially if your little one is attending a pirate themed party.